Stu (From Scotland | Working in Kyoto, Japan) on 3 March 2017 in Architecture and Portfolio. 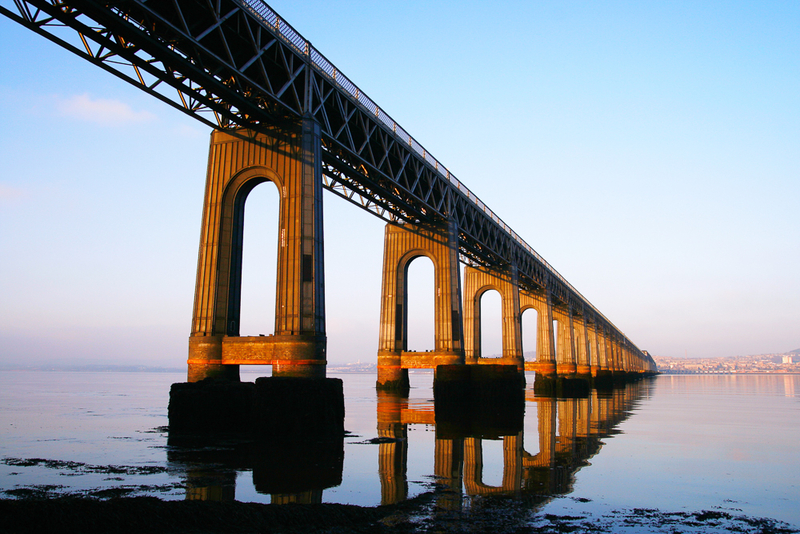 The Tay Bridge carries the main-line railway across the Firth of Tay in Scotland, between the city of Dundee and the suburb of Wormit in Fife. Its span is 2.75 miles (3.5 kilometres). The present structure is the second one on its site. From about 1854, there had been plans for a Tay crossing, to replace an early train-ferry. The first bridge, opened in 1878, was a single-track lattice design, notable for lightness and low cost. Its sudden collapse in a high wind on 28 December 1879 was one of the great engineering disasters of history, and its causes are still debated today. Beautiful perspective, light and colors ! Excellent composition and perspective. Stunning capture. Gorgeous light and color. Fantastic point of view! A lesson well learned it seems. A beautiful image in this warm light.